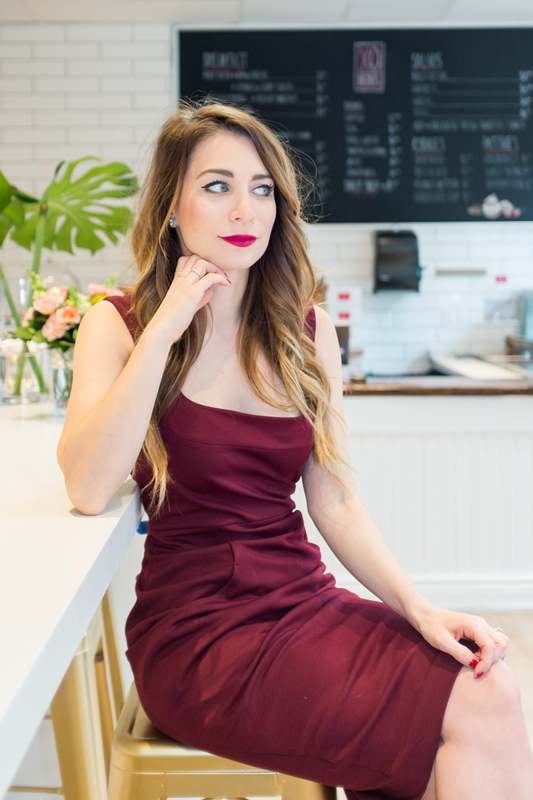 OOTD - Valentines Day Style With Rachel Sin | La Petite Noob | A Toronto-Based Fashion and Lifestyle Blog. Valentines day is quickly approaching and although I don't have any formal plans, I'm having fun planning out a love day wardrobe. 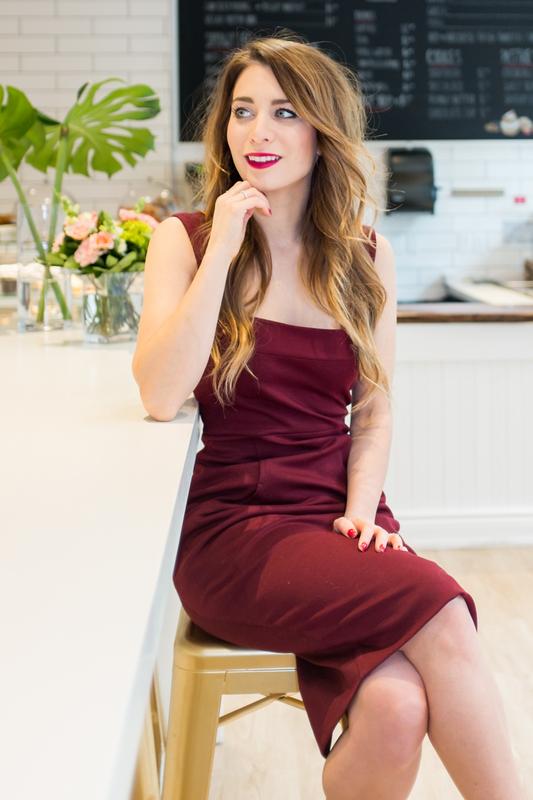 Enter this gorgeous oxblood number, the Lana dress from Canadian designer Rachel Sin. I fell in love with the designs of Rachel Sin during this past Fashion Week and was absolutely smitten during the runway show. Not only am I thrilled to be wearing one of her designs, I'm also totally in love with this bold burgundy colour - there really is a power in wearing a red dress! Pair everything with some strappy heels from Le Chateau and some curls, and you're Valentines Day ready - even if you don't have plans yet. As someone who's trying to build their shoe collection, I appreciate the variety that Le Chateau shoes provide. For those of you unfamiliar with the brand, Le Chateau is a Canadian retailer with stores all throughout Canada and the Middle East. When I saw these strappy heels, I knew that they had to be mine. Not only do the straps add interest to your basic black pump, but they also make the shoe extremely comfortable. I also appreciate the closed, pointed toe that allows me to wear these gorgeous shoes during the colder months. Since I'm wearing all Canadian brands, it only seemed fitting to visit one of my favourite local hangouts! 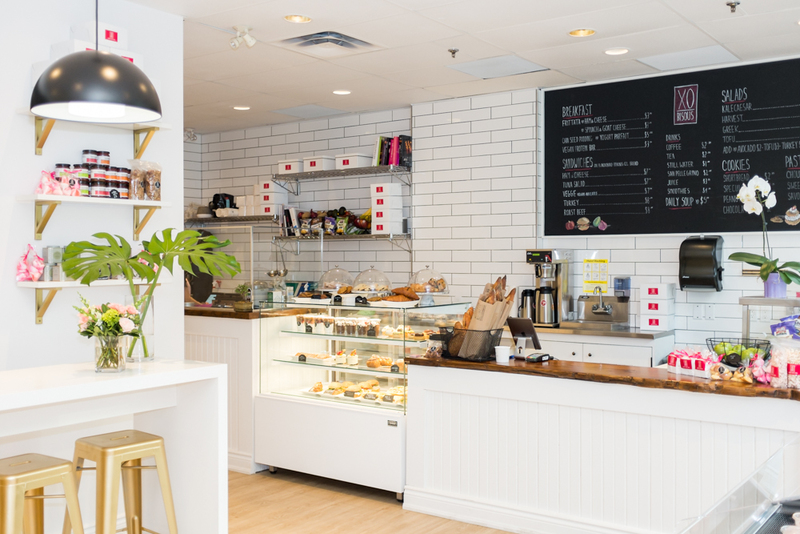 XO Bisous is a new addition to my area in Toronto, and already has gathered a following for their delicious pastries and expertly decorated space. I'm a sucker for their Choux Balls and can't seem to walk by without picking one up! If you're in Toronto, you've got to check out XO Bisous. What do you guys think? Are you into the oxblood dress for Valentines Day? Have you started planning your love day wardrobe? Let me know! You look absolutely stunning, that shade of burgundy looks so great on you! And your location, so pretty, I'm sure the pastries taste amazing! I love your outfit of the day! You look gorgeous!!! Bold colours look so great on you. And that cafe is so cute! Definitely going to have to check it out on my next visit to downtown TO. Beautiful shoes! And your lipstick is amazing, what colour/brand are you wearing? Thank you! I use a combination of two MAC lipsticks - Rebel and Pleasure Bomb (limited edition.) Hope that helps! I really love those heels and I'm a big fan of the oxblood color dress! I love that you did your outfit shoot in such a cute bakery! I love it! !Please tell me you get to keep the dress! !IT looks amazing on you. The colour and cut is fantastic. Happy pre Valentines!! Thank you Eleni! You've GOT to check out Rachel Sin, her dresses are beyond amazing and flattering. Happy pre Valentines Day! You definitely look Valentine's Day ready! Such a beautiful dress! Nice post ,dear. Very interesting. The dress is absolutely beautiful; definitely Valentines Day material! Pretty look. I love your dress. You look so stunning! That dress is beautiful and I love the deep shade! Thank you! I love the shade of the dress too, I think it would be so flattering on all skin tones! You look stunning! And the colour looks so magical on you. Loving that you took snaps in this cute cafe! Can we add it to the list of places to checkout?! So gorgeous! I love how these pictures turned out, indoors shooting can be so hard sometimes. You look super gorgeous! such a great look! Absolutely love your dress, you looked amazing in this Valentines Day dress!